jTWSdata is a data application for Interactive Brokers that creates and continuously updates many data files and database tables concurrently throughout the day. 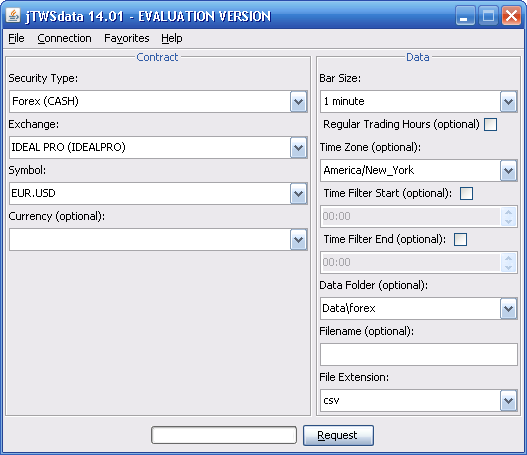 Several symbols, timeframes and data output types are supported. jTWSdata runs on Windows, Mac and Linux. This is a screenshot of the main graphical interface window (click to enlarge) showing input fields to specify the contract and data to be requested by clicking the request button at the bottom. Many data requests can be performed from the graphical interface by successively specifying different contracts and data details and clicking the request button. Output data types: plain text file (.txt, .text, .csv), MetaTrader 4 binary file (.hst), SQL file (.sql), HTML file (.html, .htm), random access text file (.r.txt, .r.text, .r.csv), SQLite database (.sqlite) and PostgreSQL database (.postgresql). Note: SQLite and PostgreSQL output is only available on request on specific jTWSdata configurations. Functionality to restore the previous session when jTWSdata is restarted (from the graphical interface). Note: existent data files and database tables are overwritten with new historical back-fill and real-time data (old data is discarded to avoid duplicate data records). Forward this page to someone. Copyright © 2007-2019 Trading Software Lab. All rights reserved.